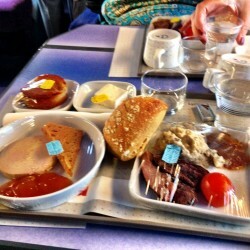 We’d been looking forward to christening the train travel portion of our latest trip to Europe aboard TGV Lyria. This high speed train from Paris to Zurich was part of a transportation-packed day which ended in Vaduz, Liechtenstein. TGV (Train a Grande Vitesse, literally “high speed train”), a subsidiary of the French National Railway system (SNCF), was envisioned in the 1970’s. 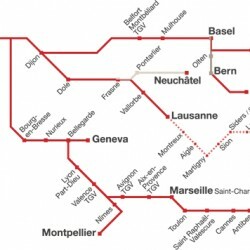 Over the next 30 years, high speed rail networks developed throughout Europe. This was going to be the first time I’d crossed a border, and Pete’s first time altogether, in a high speed train. 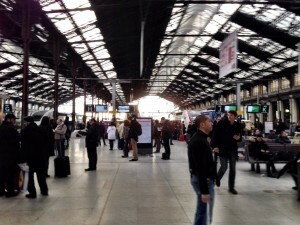 It was a speedy taxi ride in the golden light of sun-up from our hotel in the Trocadero neighborhood to Gare de Lyon. And it was a piece of cake to find the beautiful Lyria #9211’s sleek nose on the platform, and locate our assigned first class seats in Car 13. Why take the high speed train? For us, it’s a no-brainer. Airports aren’t our favorite places to begin with; they’re inconveniently located, requiring transfers into city centers. You don’t get to see much from an airplane window. Plus, early arrival for security purposes, tarmac delays, and luggage nightmares just bleed the fun. By contrast, the high speed train whisks you comfortably, conveniently, and even scenically, from city center to city center. This takes a similar or even less amount of time when you factor in air travel hassles. 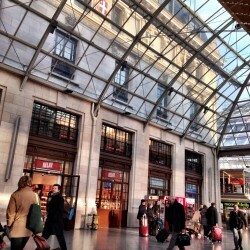 TGV Lyria travels five times per day between Paris and Zurich. Travel time is about 4-1/2 hours. Customs and ticket checks in first class are courteous and unobtrusive. 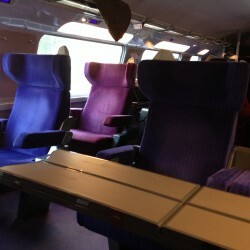 TGV Lyria is a beautiful train, inside and out. Our “Club 4” style seats faced each other with a folding, expandable work table between. We were to find that this configuration suited us best for extended periods. We could spread out with our electronics (convenient 220v outlets for charging, too). 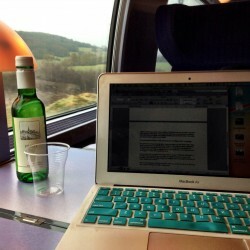 I wrote half a dozen blog posts while we zoomed across the French and Swiss countryside at speeds of 200mph. The ride was swift and smooth. First class includes LyriaPremiere service delivered by friendly staff. We were offered newspapers and magazines, and a hearty lunch. There is a buffet carriage at which those who want to stretch their legs can purchase additional cocktails, beer, wine and snacks. Carriages have WC and vending, and forward carriages accommodate disabled travelers and cyclists with wheelchair accessible seating and bike storage. The entire train is non-smoking. About midway through our trip, I found myself wishing we’d planned for more travel on this high speed train line throughout France. As well, this first part of what was to be a journey of several weeks was so pleasant, we felt confident in our choice to go by surface for as much of the trip as was practical. 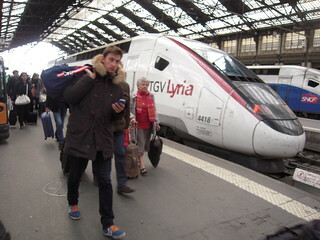 Sadly, we were to find out not all European trains are equal to the TGV Lyria. Enjoy it if you get the chance!